Turn 20 fat quarters into a beautiful quilt in 3 hours! 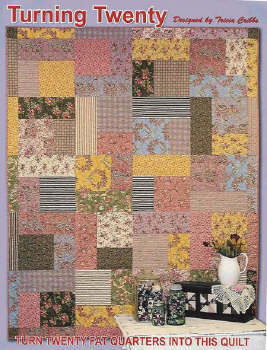 Turning Twenty is the perfect pattern if you are a beginning quilter, a dream if you are an experienced quilt maker, and wonderful for classes. Finished size is 70" x 86". This pattern comes in a full-color book format with lots of pictures and diagrams - a very nice pattern!